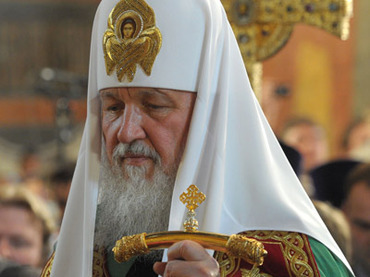 Moscow, June 28, Interfax – The Russian Orthodox Church is the backbone of Russia, said Patriarch Kirill of Moscow and All Russia. “Most people have perceived the Russian Church throughout Russia’s history as something that cements our people. It is the spiritual clip, the line of the nation’s self-identification and the common ground: if we ruin it we will surely ruin our Fatherland,” the Patriarch said after a service at the Kremlin’s Assumption Cathedral. “Although we live in times when religions are chosen freely and when the Church is separated from the state, the Russian Orthodox Church continues its great ministry, uniting the nation and maintaining the unity of our Fatherland,” he said. “That is why it has always been the main target for those who want to ruin the country and to disorganize the life of the nation. All invaders, starting from the Kremlin’s conquerors who enslaved the country in the 17th century, including Napoleon and Hitler, wanted to ruin and split the Russian Orthodox Church,” he said. “God help all of us and our church to overcome temptation, deceit and treachery of this century, and to continue the amazing service to the fullness of human life and to the salvation of human souls,” the Patriarch said. On June 28, the Russian Orthodox Church commemorates Metropolitan Iona of Moscow and All Russia, the first primate of the Russian Orthodox Church since it gained autocephaly.